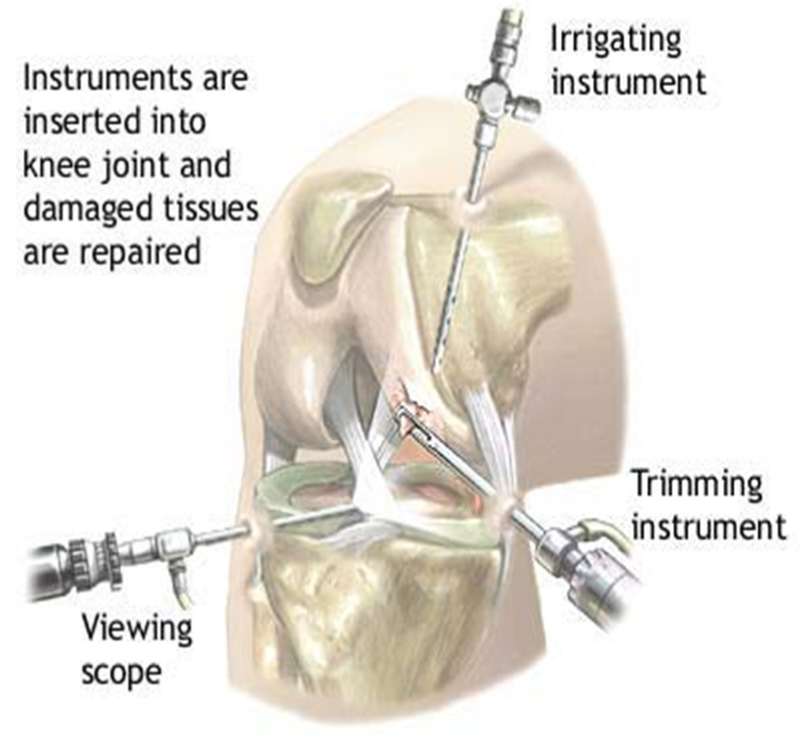 A knee arthroscopy is a common surgical procedure in which a joint is viewed using a small camera. An arthroscopy gives doctors a clear view of the inside of the knee and this can help them diagnose and treat knee problems. The term arthroscopy comes from two Greek words – arthro (joint) and skopein (to examine). During the procedure, your orthopaedic surgeon makes some small incisions into the skin and inserts the arthroscope (a small camera instrument about the size of a pencil) into your knee joint. The arthroscope sends the image to a television monitor. On the monitor, your surgeon can see the structures of the knee in great detail, and can assess the amount or type of injury. Any problems can be repaired or corrected if necessary. Along with the scope, fine instruments can be inserted through the incisions. These instruments can be used to trim any damaged ligaments or remove any loose bodies. This type of surgery has been shown to be far less traumatic to the muscles, ligaments and tissues of the knee. 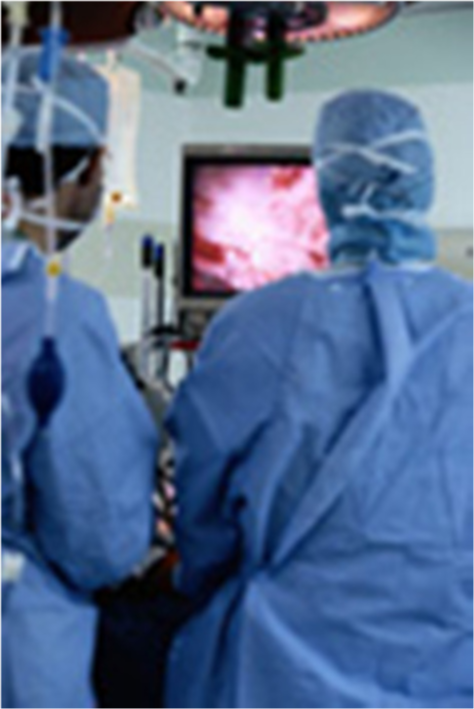 The arthroscopy can also be used as a diagnostic tool before moving to an open procedure. Technical advances have led to high definition monitors and high resolution cameras. These and other improvements have made arthroscopy a very effective tool for treating knee problems. It is reported that more than 4 million knee arthroscopies are performed worldwide each year. If you decide to have knee arthroscopy, you may need a medical assessment to determine if you have any problems which may interfere with your surgery. Before surgery, tell your orthopaedic surgeon about any medications or supplements that you take, and you will be informed as to which medicines you must stop taking before surgery. To help plan your procedure, your orthopaedic surgeon may order pre-operative tests such as an x-ray or magnetic resonance imaging (MRI). Prior to your surgery, you will be given a theatre information pack which contains information on the entire surgical experience from pre surgery through to when you are back at home. It is important that you read all the information carefully and ask questions if there is anything you don’t understand. Almost all arthroscopic knee surgery is done as a day surgery procedure. You will likely be asked to arrive at the hospital an hour or two before your surgery. Do not eat or drink anything after midnight the night before your surgery. Your surgeon’s first task is to properly diagnose your problem. He will insert the arthroscope and use the image projected on the screen to guide it. If surgical treatment is needed, your surgeon will insert tiny instruments through another small incision. These instruments might be scissors, motorized shavers, or lasers. This part of the procedure usually lasts 30 minutes to over an hour. How long it actually takes depends upon the findings and the treatment necessary. You will be moved to the recovery room and should be able to go home within 2 to 4 hours once your pain has settled. Be sure to have someone with you to drive you home. 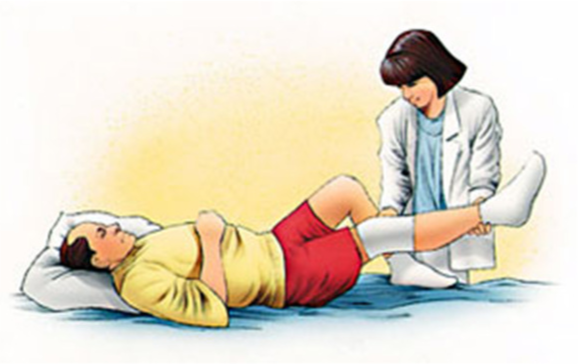 Keep your leg elevated as much as possible for the first few days after surgery. Apply ice as recommended by your doctor to relieve swelling and pain. Keep your incisions clean and dry, and leave the dressings on for at least 10 days after the surgery. Your surgeon will see you in the clinic two weeks after surgery to check your progress, review the surgical findings, and begin your postoperative treatment program. On average, you should be able to return to driving five days after surgery. You will be prescribed pain medication to help relieve discomfort following your surgery. You will be required to take a daily dose of Aspirin to lessen the risk of blood clots. If you are not able to take Aspirin, another alternative will be recommended. You should exercise your knee regularly for several weeks after surgery. This will restore motion and strengthen the muscles of your leg and knee. Exercise will play an important role in how well you recover. A formal physiotherapy program may improve your final result. What sort of outcome should I expect? Unless you have had a ligament reconstruction, you should be able to return to most physical activities after 6 to 8 weeks, or sometimes much sooner. Higher impact activities may need to be avoided for a longer time. You will need to talk with your surgeon before returning to intense physical activities. If your job involves heavy work, it may require a longer rehabilitation period before you can return to your job. Discuss when you can safely return to work with your surgeon. The final outcome of your surgery will likely be determined by the degree of damage to your knee. For example, if the articular cartilage in your knee has worn away completely, then full recovery may not be possible. You may need to change your lifestyle. This could mean limiting your activities and finding a low-impact exercise alternative.